It’s hard to believe it’s mid-December at the Madrid-Waddington Central School. 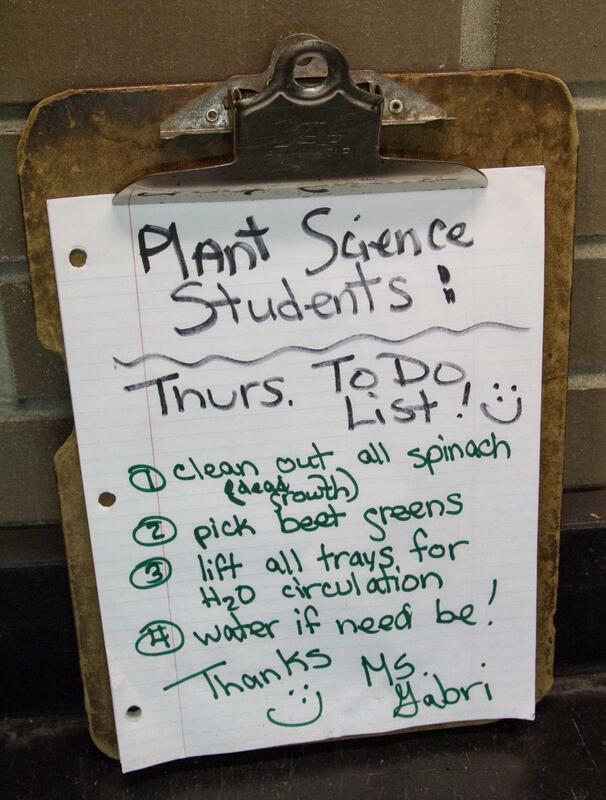 As snow drifts into the exterior courtyard, lush green plants fill sturdy metal racks in the school’s garden room. Eight six-foot tall grow racks boast salad greens and herbs as well as a few experimental strawberry and cucumber plants. Several baby cucumbers dangle from vines and basil seedlings look vibrant against dark organic soil, made entirely of composted material from prior plantings. 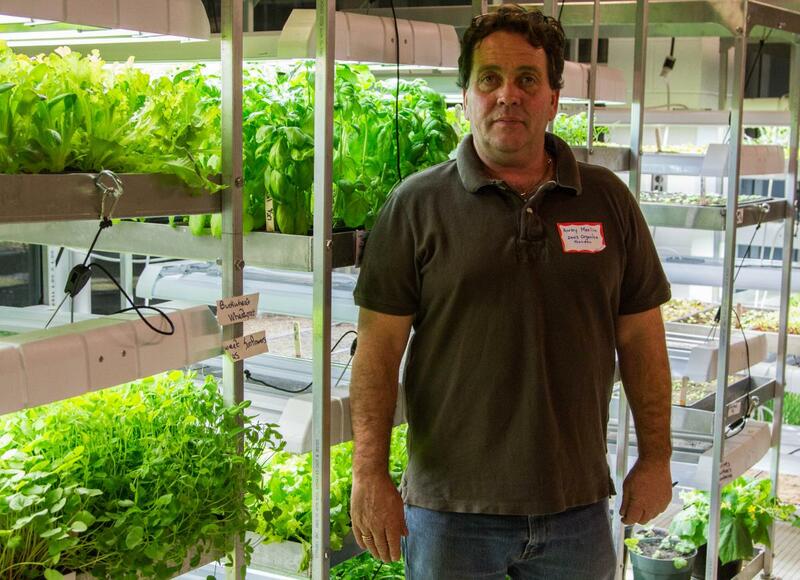 The grow racks are the invention of Massena-based farmer and entrepreneur Andy Maslin and his family, who have worked for over 10 years to develop the indoor organic grow rack system, marketed through 2445 Organics. “After so many different designs, this is what worked best,” said Quinton Maslin, one of three sons involved in the business. “From the soil mixture, right down to the reds and blues in the lights.” The current version of the system, he said, is efficient, effective and highly productive.The Maslins are now sharing this year-round growing system with North Country schools. 2445 Organics Founder Andy Maslin and his three sons and co-owners Zach, Quinton and Andy Jr.
Assemblywoman Addie Russell, ANCA’s Farm to School Specialist Alex Merrell and Superintendent Eric Burke were joined by newly elected Assemblyman Billy Jones and over a dozen North Country school representatives at a recent open house to learn about the effort at Madrid-Waddington Central School. Look what's growing in the Madrid-Waddington School garden room! 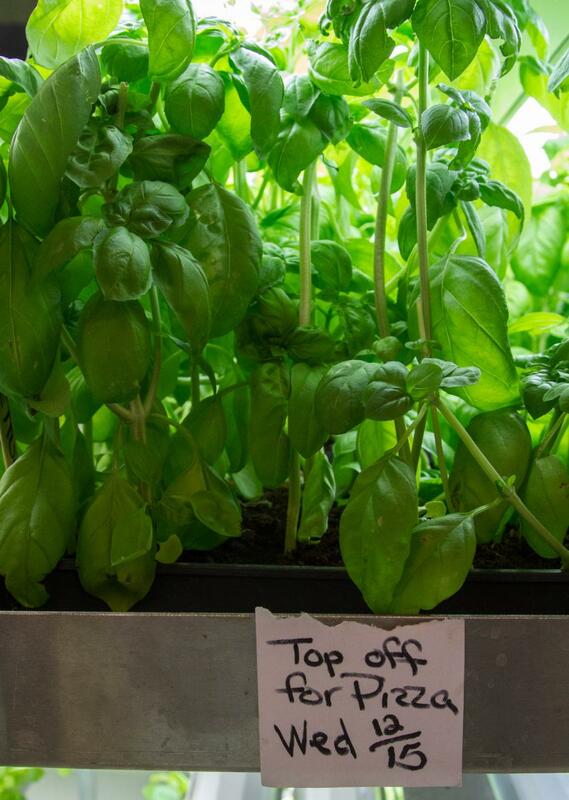 Since Fall 2015, school staff have increased the indoor garden from two to the current eight racks; they hope to purchase an additional two racks through Assemblywoman Russell’s Drive for 25 Farm to School grant program, administered through ANCA. This pilot program enables K-12 school districts in Jefferson and St. Lawrence Counties to increase the amount of New York State-grown food served in their cafeterias. 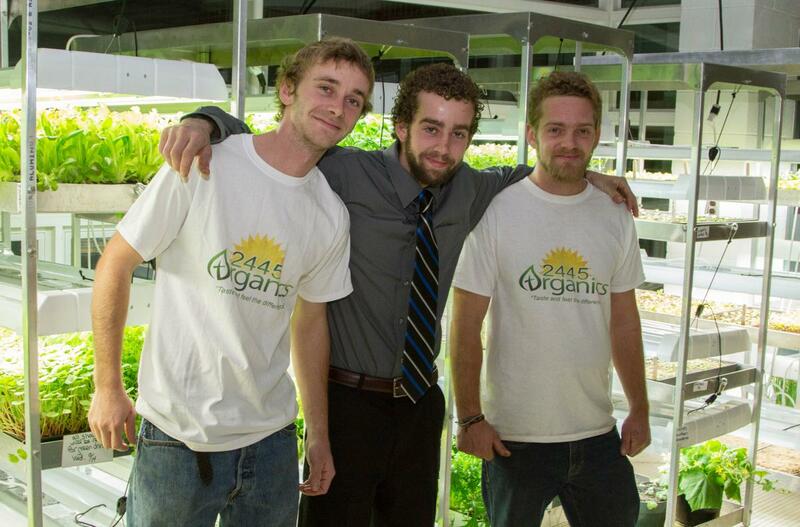 Participating schools can buy the 2445 Organics grow racks to supplement other purchased produce. According to Assemblywoman Russell, this investment supports different facets of Farm to School program goals: Beside providing fresh, local and healthful food, an indoor gardening program engages students in the steps involved in putting food on the table. 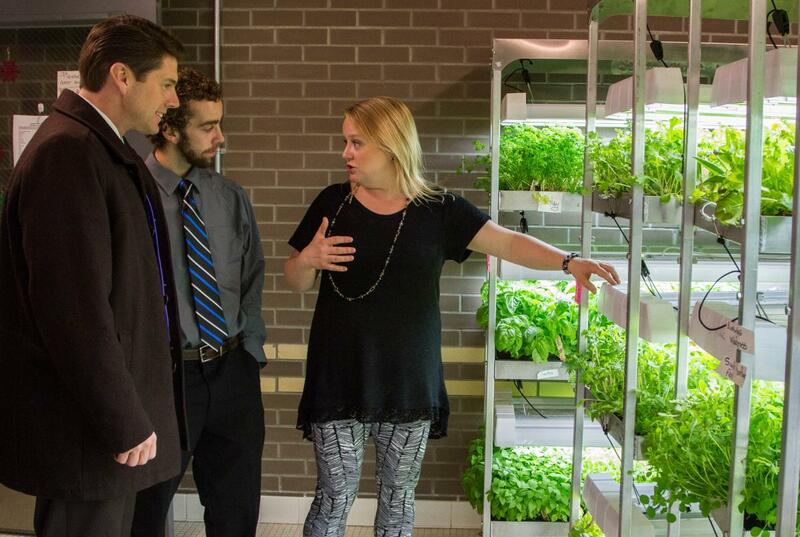 Assemblywoman Addie Russell speaks with Assemblyman Billy Jones and 2445 Organics co-owner Quinton Maslin about the grow racks at Madrid-Waddington Central School. The technology is reasonably priced, she said, and can even allow students or entrepreneurs to start their own produce business and scale up as they gain a customer base. The end result is more local food in schools, restaurants and other facilities and more dollars retained by local businesses. 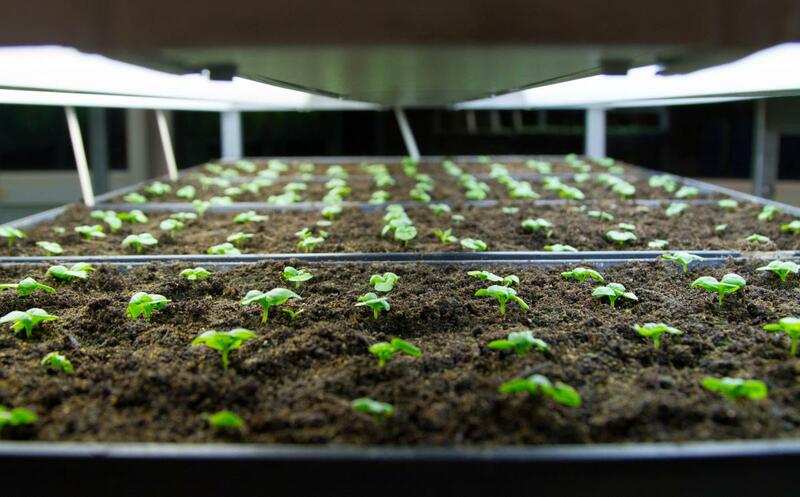 We look forward to watching this network of entrepreneurs, school administrators, students and community leaders expand as more communities adopt indoor gardening technologies. Green juice and fresh salad throughout the long North Country winter? Sounds good to us!